Known for their fierce skills in battle and warrior style, the amazonian women of Themyscira are badass! No wonder America’s favorite heroine is from their tribe. From the new Wonder Woman movie, the Wonder Woman Movie Adult Shield is a great add to your already awesome costume. The lightweight 24” diameter shield, is perfect for defeating all the bad guys this Halloween. 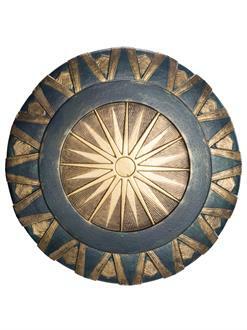 The shield features an aged gold and bronze pallet with a centered sun detail. Order your Wonder Woman shield for adults today!